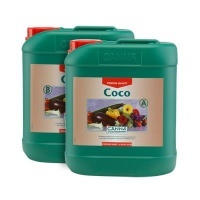 Canna Coco Nutrient A&B 5 Litres is a 2-part nutrient especially for use with plants grown in pots with coco. Designed for run-to-waste hydroponic systems or regular hand-watering, and works best when 10-20% run-off is achieved. 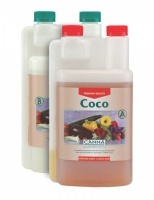 Coco grow-mediums tend to naturally release potassium but absorb calcium. Canna Coco Nutrient compensates for this by containing less potassium and more calcium than standard plant feeds. This product contains high quality mineral ingredients to provide all the basic macro and micro nutrients that plants need for lush, healthy growth.